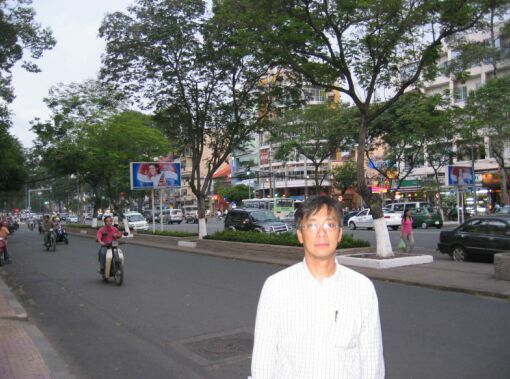 On a business trip to Singapore, Hoa was able to stop for more than 20 hours in Ho Chi Minh City. This is first trip back to HCM city (Saigon) in over 30 years. 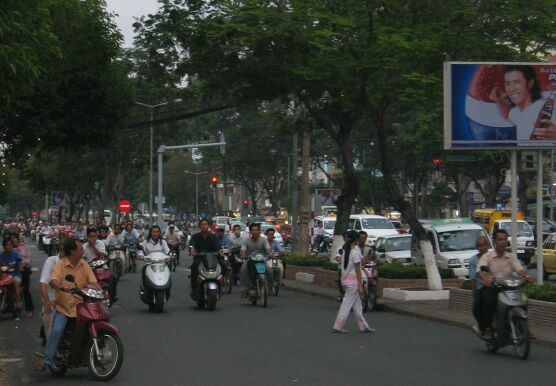 Hoa was able to compare the old Saigon to the new city. Things have changed for the better but compare to other Asian City like Singapore, Thailand etc.. Vietnam is still very behind economically. There are no trace of the war of what was left of it.. It is a bustling and lively city! 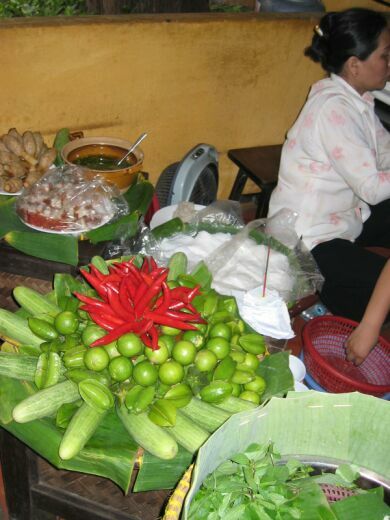 Lunch at Quan Ngon located in District 1- guests can sit indoors at one of the many dark wooden tables or enjoy the open air under a canopy of bamboo and banana tree. 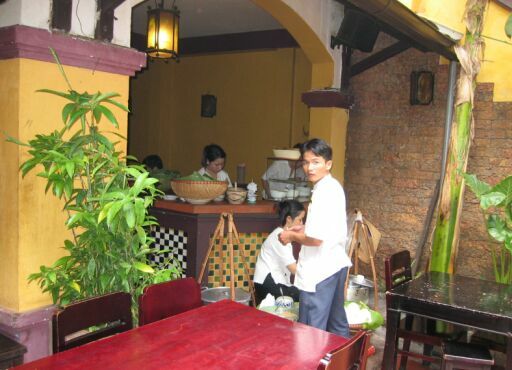 The restaurant's largest room has the look of a village temple and is surrounded by small market stalls with an architectural detail often seen in the countryside – yin-yang tiles on the roofs. 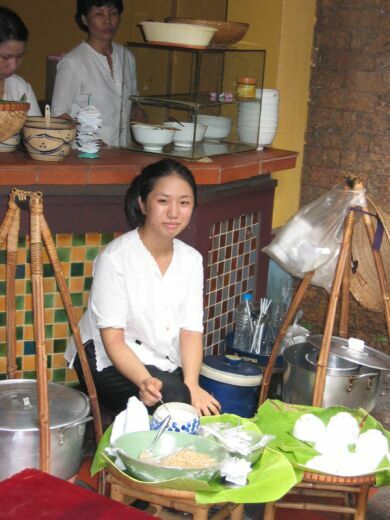 One of small stall that offer dished from the three major regions of Viet Nam, like banh tom (shrimp pancake) and eel vermicelli soup from Ha Noi. Another view of the ladies preparing food. You can order directly from the waiters or if you are a foreigner you can stroll around and order the food that are displayed and prepared in front of you. We have cucumber, lime and hot pepper. It is so exotic looking! We are still inside the restaurant. This is not a blurry picture!!! Because of the hot weather, they blow mist (thin particle of water) in the air (like in Disney Land on a hot summer). 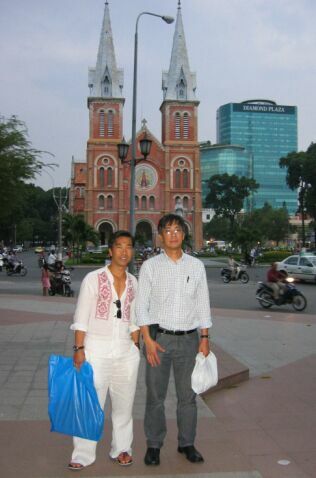 Here we have Thuan, Hoa, Nhat, a childhood friend he has not seen for over 30 years. 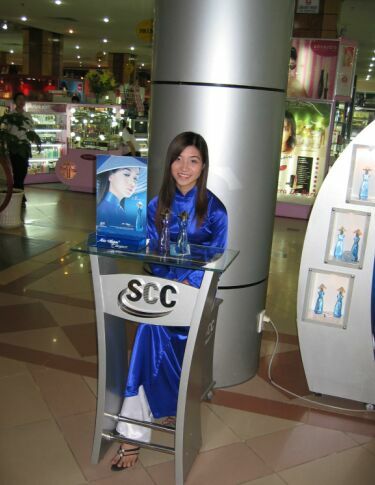 Girl in Front of Mall. 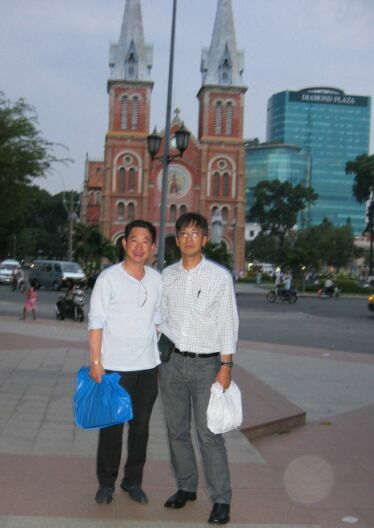 Looks pretty much as here in the states..
Thuan and Hoa in front of Notre Dame Cathedral. In a predominantly Buddhist country, Notre Dame stands tall in the center of Saigon. It was built during the late 1870s-1880s by the French (hence the name) You can visit at anytime, and even attend mass if you desire. Masses are held in Vietnamese and English. Just remember, places tend to shut down during lunchtime, so you won't be able to get into the cathedral around midday. Dinner at a nice Vietnamese restaurant. Hoa can not remember the name of the restaurant. It was an upper scale restaurant with life music (Violin player etc..) and each table get their own waiter. Needless to say, service was the best!